Now more than two years outbound from its historic encounter with Pluto, NASA’s New Horizons spacecraft is on target for a fleeting flyby less than 2,200 miles (3,500 kilometres) from 2014 MU69, an icy, city-sized world set to become the most distant object ever visited, just after midnight Jan. 1, 2019. Scientists now say the probe may be able to pursue another destination some time in the 2020s. NASA announced the spacecraft’s flyby plan earlier this month after scientists determined New Horizons will whiz by 2014 MU69 at a distance of 2,175 miles and a relative velocity of more than 31,000 mph (14 kilometres per second). The mission’s target is an icy, reddish remnant from the early solar system more than 4 billion miles (6.5 billion kilometres) from the sun, and a billion miles farther away than Pluto. Ground-based observations suggest 2014 MU69, discovered during a search by the Hubble Space Telescope in 2014, is a dual-lobe world, with its two segments either orbiting one another or stuck together. Scientists estimate each body that makes up 2014 MU69 is between 11 and 12 miles (18-20 kilometres) in diameter. New Horizons will make its closest approach to 2014 MU69 at 0533 GMT (12:33 a.m. EST) on Jan. 1, 2019, according to Alan Stern, the mission’s principal investigator from the Southwest Research Institute. The flyby will occur in the late evening on New Year’s Eve in the other U.S. time zones. Ground stations will not be in communications with New Horizons while it is closest to 2014 MU69, allowing New Horizons to point its cameras and instruments toward the target, Stern wrote in an email to Spaceflight Now. Once the probe’s dish-shaped antenna is trained back on Earth, imagery and data will begin to trickle down soon after the flyby, making the six-hour trip at light speed at a rate of just 1 to 2 kilobits per second. At that downlink speed, it will take more than a year-and-a-half to return all the scientific goods gathered by New Horizons. Scientists weighed scientific return with risk in determining the flyby distance. “The considerations included what is known about MU69’s size, shape and the likelihood of hazards near it, the challenges of navigating close to MU69 while obtaining sharp and well-exposed images, and other spacecraft resources and capabilities,” said John Spencer, New Horizons’s flyby planning lead at SWRI. New Horizons will pass nearly four times closer to MU69 than it did to Pluto, which is about 100 times bigger. In a Sept. 6 presentation to NASA’s Outer Planets Assessment Group, a community of planetary scientists specializing in the outer solar systems, Stern said the spacecraft’s telescopic Long Range Reconnaissance Imager will resolve features on MU69’s surface as small as 115 feet (35 metres) in each pixel. When New Horizons visited Pluto, the LORRI black-and-white camera imaged the dwarf planet at around 262 feet (80 meters) per pixel, according to Stern. Launched in January 2006, New Horizons reached its primary destination July 14, 2015, speeding past Pluto and its moons to capture the first up-close views of the faraway world. Mission managers planned to send New Horizons to a second target after Pluto, but scientists were unable to find a suitable object in the probe’s flight path through the Kuiper Belt until a dedicated sweep with the Hubble Space Telescope turned up 2014 MU69 and two backup candidates. New Horizons fired its thrusters soon after the Pluto flyby to line up for an opportunity to reach 2014 MU69 on New Year’s Day 2019. New Horizons will search for moons and study the geologic structure and composition of MU69 during the encounter. If the probe detects any dust or debris hazards, such as rings, controllers have the option of diverting New Horizons to a safer distance of 6,000 miles (10,000 kilometres) from MU69. The spacecraft has enough hydrazine fuel and electrical power from its plutonium generator to remain functional until around 2035, Stern said, potentially giving the probe enough reserves to adjust its course to fly by another Kuiper Belt Object after MU69. Soon after the Pluto encounter, NASA approved a five-year extended mission for New Horizons to continue operating through 2021, a time span that encompasses the MU69 flyby. Continued operations by New Horizons after 2021 will require another approval by NASA Headquarters. Stern said further searches with Hubble and New Horizons’ own camera will look for dimmer, more distant destinations in the craft’s direction of travel beyond MU69. The Large Synoptic Survey Telescope in Chile will also come online around 2022, giving astronomers a powerful new set of eyes to search for Kuiper Belt Objects. Mission planners initially budgeted propellant for New Horizons to fine-tune its speed toward MU69 to better match the object’s rotation and improve visibility for the craft’s cameras. But scientists now believe the probe is approaching MU69 along its rotational axis, eliminating the need for additional rotational phasing maneuvers and saving fuel to reach another target in the 2020s. The Kuiper Belt is a zone of millions of little-studied objects beyond the orbit of Neptune, ranging in size from rocks and boulders to Pluto, the belt’s largest resident. New Horizons is conducting long-range observations of Kuiper Belt Objects. The spacecraft will not get close to those bodies — they will be millions of miles away — but New Horizons will be much closer to them than any telescope. 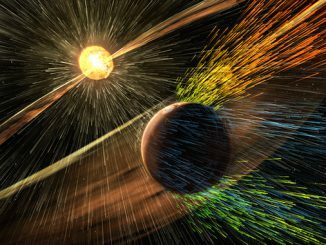 The mission is also gathering data on the solar wind and plasma environment in Kuiper Belt, and some scientists are interested in turning its instruments to look at other planets from New Horizons’s unique viewing angle. New Horizons awoke from hibernation Sept. 11 for three months of scientific observations of Kuiper Belt Objects, a software update, and a course correction maneuver Dec. 9. It will go back into hibernation Dec. 22 until waking up again June 4 to begin flyby preparations. “This is the only spacecraft that’s made studies of the Kuiper Belt in situ, and it’s the only one that’s currently planned, so we’re trying to make the most out of it for our community and for generations to come,” Stern said. 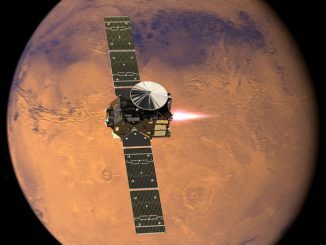 A European-built orbiter designed to seek out the source of methane on Mars slipped into orbit around the red planet Wednesday after a seven-month interplanetary journey, but mission control lost contact with an experimental landing probe just before touchdown. 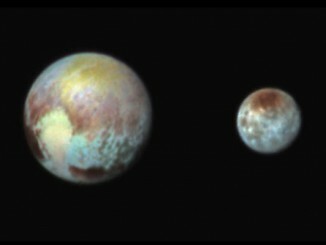 Pluto and its Texas-sized moon Charon share an alien environment on the solar system’s outer frontier, with patches of organic ices and diverse rock types illustrated in color imagery released Tuesday.